All my Custom House Signs are suitable for outdoors. However, in severe cold weather, I can't guarantee your sign if it is in a very exposed position, such as on a garden wall or by a gate, although some of my signs have been in such positions for many years. they are best sited on the wall of an occupied house. The decoration, including the numbers and letters, is permanent and will not fade, having been fired in my kiln to 1080° centigrade. Unlike some makers, who use standard transfers to produce their designs, all house signs are individually designed and hand painted to order. 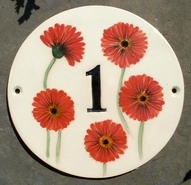 Your personalised house sign will be hand made by me from start to finish, so each individual house name or number plate is a unique work of art. First, the clay is rolled out by hand and cut to shape. Next, the letters and numbers are imprinted into the clay, although I can paint free hand fonts if you wish. Then, your house name plate will be left to dry very slowly, to avoid warping. This is why the signs take so long to produce. 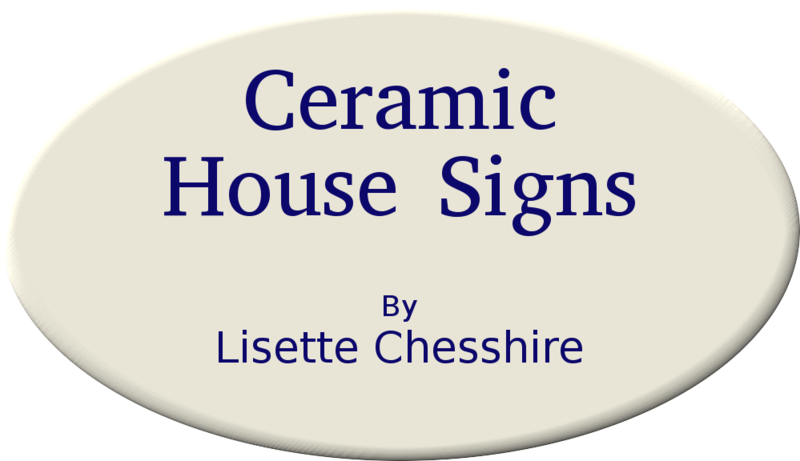 The background colour for your personalised house name plate or number plate will either be the natural creamy white colour of the earthenware clay, or will be painted with three even coats of underglaze colour. This gives a smooth, opaque background. Finally, your chosen design will be hand painted so your house name plate will be completely distinctive. Your unique design is applied with special underglaze colours before the first firing to 1060° c., and then a transparent glaze is added before a second firing to 1080° c. Finally, the back of the house sign is sealed with yacht varnish, to ensure that no moisture can enter. A house name plaque or number plaque fixed to the wall of an occupied building is guaranteed to last a lifetime, as long as it is not knocked with force. I make custom house signs in two formats. are black, dark green, dark blue & brown (other colours possible by request). are natural cream, pale blue & pale green (other colours may be possible by request). Your design will be unique. 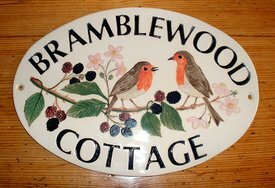 All my custom house signs are hand made, and hand painted by me in fine off-white earthenware ceramic.